Green Boost is packed with nutrient dense greens to provide the concentrated goodness found in green plants and vegetables in a convenient powder. 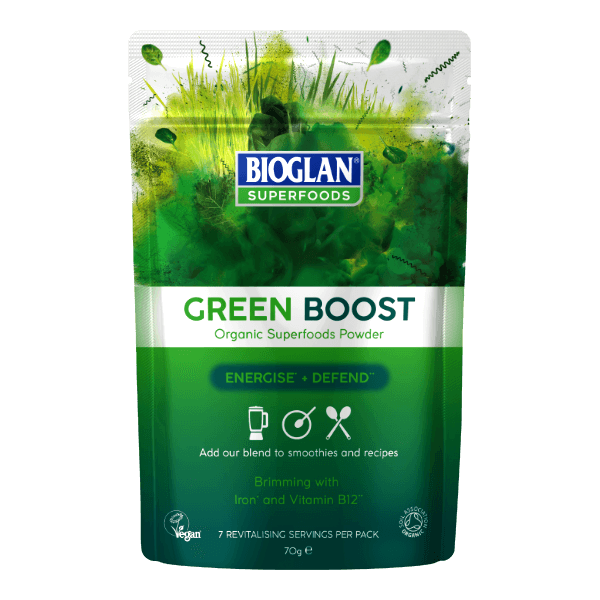 A blend of barley grass, wheatgrass, spirulina, chlorella, spinach and kale, Green Boost has no added flavours so is perfect for using in both sweet and savoury dishes as well as adding into smoothies. Green Boost can be stirred into sauces, dips and soups to add some extra green goodness. To superpower any smoothie, add 2 teaspoons of Green Boost to your blender before whizzing up the ingredients. Be adventurous and sprinkle Green Boost into muffins, pancakes or omelettes. Organic Barleygrass Powder (18%), Organic Wheatgrass Powder (18%) Organic Chlorella Powder (16%), Organic Kale Powder (16%), Organic Spirulina Powder (16%), Organic Spinach Powder (16%).